Move aside binge-watchers, ’cause binge-racers are primed and ready to speed ahead! Binge-watching has now become a millennial norm, what with the rise of streaming platforms like Netflix giving us unfiltered access to a lifetime’s worth of content. And being able to watch your favourite dramas whatever you want, wherever and whenever has evolved viewers onto a whole new level altogether: binge-racing – where Binge Racers speed through an entire season within 24 hours of its release. Here’s what you need to know about the insane ways of binge-racing and how it has taken over viewing habits all over the world (because it’s apparently a thing now). According to Netflix, there are a total of 8.4 million subscribers who have chosen to binge race on their platform. And the number of binge-racers are expected to rise, with 2016 having 20 times more launch day finishers than in 2013! Turns out, we have plenty of Singaporean binge racers in our midst. Our little red dot holds the second highest percentage of binge-racers in Asia, losing out only to our Malaysian neighbours. The amazing thing about binge racing is that it isn’t limited solely to a specific TV show genre, how long its episodes are etc. Netflix shares that while 30-minute comedies like Master of None, Glow and Dear White People rank highly amongst binge racers, hour-long thrillers like Stranger Things, House of Cards and Orange is the New Black are equally popular too. The Hallyu wave ain’t dying any time soon. Confirming what we all already knew, Netflix shares that the binge genre of choice in Singapore is K-drama, with our country having the highest percentage of binge racers globally for The Sound of Your Heart. Score one for Kwang-soo! #5 And We Love Marvel’s The Defenders Too! The fiercest foursome to hit the streets yet, Marvel’s The Defenders scored the top binge-racing spot in Asia, in countries like Singapore, Philippines, Malaysia, Taiwan, Hong Kong, Thailand, India, Japan and South Korea. Close runner-ups include Gilmore Girls: A Year in the Life, Santa Clarita Diet and Terrace House: Aloha State! While we’re still wrapping our heads around the insane binge racing routines (like watching five TV seasons in 24 hours) that people are picking up, it’s important not to get overly consumed with what’s playing on your screens. Remember, the content on streaming platforms like Netflix isn’t going to disappear anytime soon, so there’s nothing wrong with pacing yourself and truly enjoying whatever you’re watching instead of racing through it – quality over quantity! What do you think of this new binge racing fad? Have you ever binge-raced through a show? Sound off in the comment section! We all admittedly love a good scare sometimes, courtesy of our all-time favourite movie characters that show up – usually unexpectedly – in various horror movies. But do they really live up to their fright factor? Make sure you’re not alone at night reading this, and get ready to find out! Is there any other horror character more iconic than the digitally-savvy, scorned female? Whether it’s her Japanese origin or the American counterpart, we can’t tear our terrified eyes away from the screen as she approaches it, before breaking barriers and crawling out into ‘reality’. Although nobody uses VCRs anymore, it doesn’t change the fact that Sadako will go down as a timeless movie villainess. Clowns always had that undeniable creep factor, but perhaps none more so than Pennywise from It. Originally giving our parents’ generation nightmares in the 1990 miniseries, the 2017 movie remake brings his scare factor to a serious new level. Sporting updated demonic makeup and a less colourful outfit, 2017’s Pennywise fully establishes that we’ll never look at a clown the same way ever again. Even Ronald McDonald looks like a killer now. Arguably the OG (original gangster) of serial killers, the hooded, masked murderer of the Scream film series is a bona fide veteran in the slasher movie genre. Over four movies, Ghostface stalked, taunted, and tortured the films’ central characters that began with his signature phone call. Thanks to spoof movie Scary Movie, fear of Ghostface has waned over the years, but trust MTV to revive the storyline to a hit TV series to keep the scares – and well, screams – living on. Chucky has been terrorising victims and giving dolls a bad name since way back in 1988’s cult classic Child’s Play. Initially intended as a sadistic, murderer in a Good Guy doll body, Chucky’s character has seen a surprising arc over the sequels. While his conniving and vicious killings remain a constant, it’s his witty and sarcastic remarks that has gained devout fans to keep up with the franchise, eventually spawning the upcoming Cult of Chucky. Not forgetting that he’s a family guy too – with wife Tiffany his partner-in-crime – that makes him an ironic horror character to root for. Joining Chucky’s league of spooky possessed dolls is Annabelle, who became such a highlight of The Conjuring that she got her own movie series. While Chucky had full dialogue to reveal his evil thoughts and ways, Annabelle’s enigmatic and quiet nature is certainly what’s unsettling to viewers. The rag doll doesn’t utter a single word, instead choosing to strike fear with a single glare that gets under our skin every single time. Put her away! If The Conjuring giving us Annabelle wasn’t bad enough, then The Conjuring 2 knew just how to make us quiver harder by introducing a very disturbing, demented nun only known as Valak. The ruthless creature is definitely not one we’d like running into on a late night walk home, and who could forget the chilling scene of Valak materialising from a painting? We might shield our eyes and cower away when its spin-off The Nun releases next year, but we all know we’ll still end up catching it in cinemas somehow. Less ghostly and more shocking, Saw‘s titular antagonist and king of gore still sends shivers down our spine seven movies later. The character’s uneven mask and swirly cheeks are only made even creepier by his propositions: kill or be killed. And his usual targets of sinners to mirror their wrongdoings only adds on to the disturbing plot of the Saw franchise, making us wanting to be on our best behaviour. Get ready to be shaken up by Jigsaw’s antics yet again later this year, with Jigsaw showing in cinemas 2 November 2017. Which is your favourite Halloween character of all time? Let us know in the comments below! It has been three years since Secondhand Serande’s last album, and a decade since his tunes rocked our teenage playlists. This year, we caught up with John Vesely to find out what he has been up to and what we can expect in the near future. What ever happened to Secondhand Serenade? With hit songs like ‘Fall For You’ and ‘Your Call’ taking over the airwaves (and our playlists) close to a decade ago, no one expected the quiet retreat from the limelight. But this year, which marks the tenth anniversary of Secondhand Serenade’s debut record Awake, John Vesely (the man behind the famous name) is slowly reclaiming the spotlight with a re-release of his first effort. Titled Awake: Remixed & Remastered, 10 years and 10,000 tears later, Secondhand Serenade’s beloved hits got a 2017 update without leaving out any of that nostalgia and heart-wrenching sentiment the act is known for. 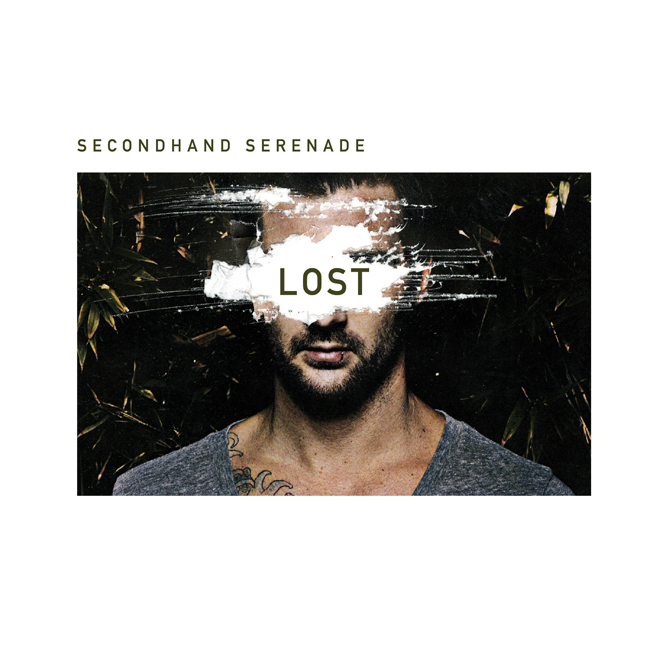 And following closely on its musical heels is the release of Secondhand Serenade’s first musical release in three years – a single titled, ‘Lost’ that we can’t stop replaying. This year, Secondhand Serenade celebrates its tenth anniversary. Has your career gone how you’ve envisioned it? 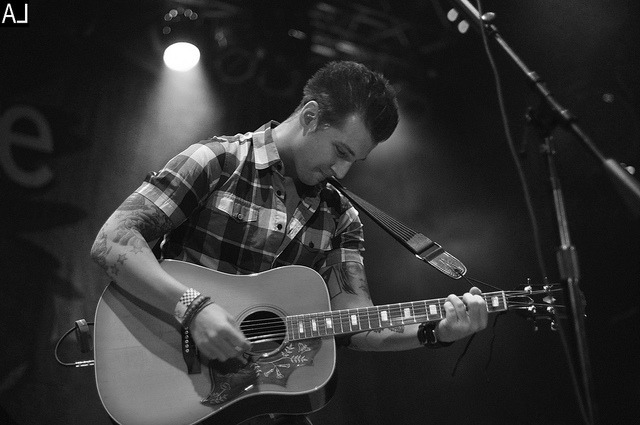 John: When I started Secondhand Serenade I honestly didn’t know where it was gonna go. I just really love making music and I love writing music. I wanted it to potentially impact the world. And to be completely honest, it is such an amazing thing for me to be on the phone with Singapore right now, and yes, that’s exactly what I wanted it to be – to reach people across the world. I love it. What were the most pivotal challenges you faced in your singing career? John: Honestly the challenge lies in how every artist strives to stay relevant, and at the same time, make good music. There was awhile when I was making music and I tried to evolve with the currents. When I decided to come back and do the tenth anniversary, I realised I was not where I started in the first place and I kinda missed writing purely from the heart about my personal experiences. This time, I wanted to go back with that so I ended up writing two new songs for the tenth anniversary release and they are written in the same way as the first album. If you had one word to describe the process of songwriting, what would it be? John: Honest – because you know people won’t relate to your songs unless you are true to yourself and true to everyone else. It really comes down to writing a piece that means something to you in a very real way. Because if it means something to you, people will then connect well with it. What is one song off Awake that you love the most? John: ‘Your Call’ is one of my favourite songs. If you can collaborate with one artist, who would it be? John: If I could collaborate with one artist … my gosh, there are so many very talented people right now. Not necessarily because of the genre, but I would love to one day work with Bruno Mars just because he can do so much with so many different genres and he is just a very talented writer and producer – always pushing boundaries. I really appreciate what he is doing. It has been a while since you’ve released new music. Tell us more about your single, ‘Lost’. Is there a story behind this song? John: I was writing differently for the past few albums and admittedly, I have evolved musically for the past ten years. However, I really wanted to stimulate the same experience that I had when I wrote Awake so I wrote a very simple, honest song about something that really happened to me. I feel like a lot of people can relate to that song because it’s about taking someone for granted. It’s about when you get comfortable in a place where you feel like you have it all, and that’s when you neglect some things that are important and don’t realise it until it’s too late. And when it’s too late, you feel like you’ve really lost everything. Uh… I took a long while to bounce back but y’know, it’s a special song to me and I want the production to be as simple as possible so that it comes from the heart. If you aren’t an artist now, what would you be? John: If I wasn’t an artist, I’ll probably be a chef. I love to cook. I cook almost everyday in my home and it’s something I’m really passionate about. I mean, it’s the same kind of thing as writing music. You create stuff from scratch and you make something beautiful. I really appreciate that a lot. So what is your favourite dish to cook? John: My favourite dish… honestly, I cook a lot of stuff. I like cooking tacos for me and my wife. And I love cooking traditional Czech dishes that my mom taught me every once in a while. We saw those tacos on Instagram! Now tell us three facts about you which many people do not know about. On the topic of your marriage, what does your wife think about your romantic songs? John: (laughs) The great thing is, she’s a writer herself. She makes songs and we often write together. She loves the fact that I write romantic songs and it’s just something she really connects with. In fact, that’s pretty much the reason why we met in the first place: it’s the music that brought us together. So yes, she’s definitely behind it. Can we expect a collaboration? John: Yes, definitely. One hundred per cent. What advice would you give to aspiring independent artists? John: Honestly, my best advice is to write as much as you possibly can. These days, it’s a lot easier to create music than it used to be with the help of technology; you can even record on your phone. So just record and write as much music as possible. Write what means something to you and if you never stop, you’ll get somewhere with it. You’ll make some sort of ground. You have to work constantly in order to get somewhere. It’s just one of those things you can’t get discouraged no matter what. Which Secondhand Serenade tunes will you be playing on repeat? Share your playlist picks with us in the comment section! 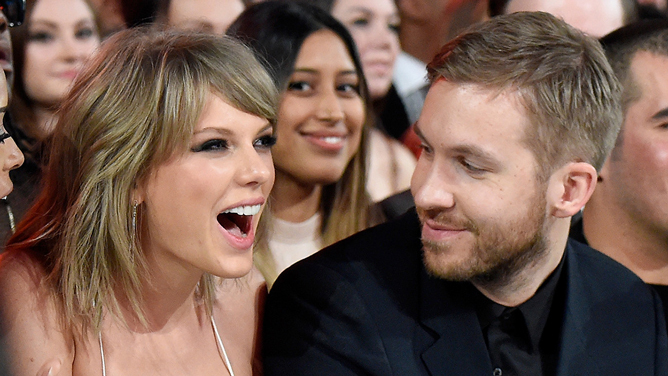 Did Taylor Swift Just Sing About Her Boyfriend While Throwing Shade At Her Ex? Will any track off Taylor Swift’s upcoming Reputation escape, diss-free? We think not. Teasing the world with a intriguing yet slightly creepy snippet of a child saying “Gorgeous” repeatedly on her Instagram, Taylor soon released ‘Gorgeous’, the third single she has shared off her upcoming album, Reputation. Unsurprisingly, the Internet went nuts – with Swifties gushing over the ’80s-sounding tune and everyone else speculating who the track was really about. And with romantic lyrics singing about “ocean blue eyes” and “being so gorgeous it makes me mad”, the popular choice naturally leans to Taylor’s current beau, Joe Alwyn. But what we’re really interested in? Taylor’s sneaky lyrics about how she’s got “a boyfriend, he’s older than us/He’s in the club doing I don’t know what”. As we all know, Taylor has only had two boyfriends who were older than her – Loki aka Tom Hiddleston (31) and Calvin Harris (27) . But with the latter being an EDM DJ whose job literally requires him to be at clubs… Which means that snide line’s most probably about Calvin. Oh the shade. Meanwhile, here are the best fan reactions so far about ‘Gorgeous’, from Swifties who’ve had the honour of listening to Reputation at private sessions with Swift both in London and at her home in Rhode Island, and the rest of the world. Which single has been your favourite so far? Share your thoughts with us in the comment section! If you’ve braved through the recent horror fest IT in cinemas, odds are you’re still shuddering in fear of chancing upon a creepy clown on the way home alone. But it seems the tables are turning ever since the world caught wind of what the actor looks like in real life, with fans now swooning over his good looks and dismissing the scare factor. Which makes us wonder – which other stunning actors have gone under unbelievably drastic transformations for the sake of their craft? IT is well, the ‘it’ costumed character (and prime Halloween costume candidate), and while the killer clown sends shivers down our spine, the actor portraying the titular role does quite the opposite. The dreamy, young actor’s good looks come as no surprise, considering he’s the younger brother of equally charming Alexander Skarsgård. Bill himself thought his extreme makeup was “terrifying” but also called the transformation process an “amazing one”. 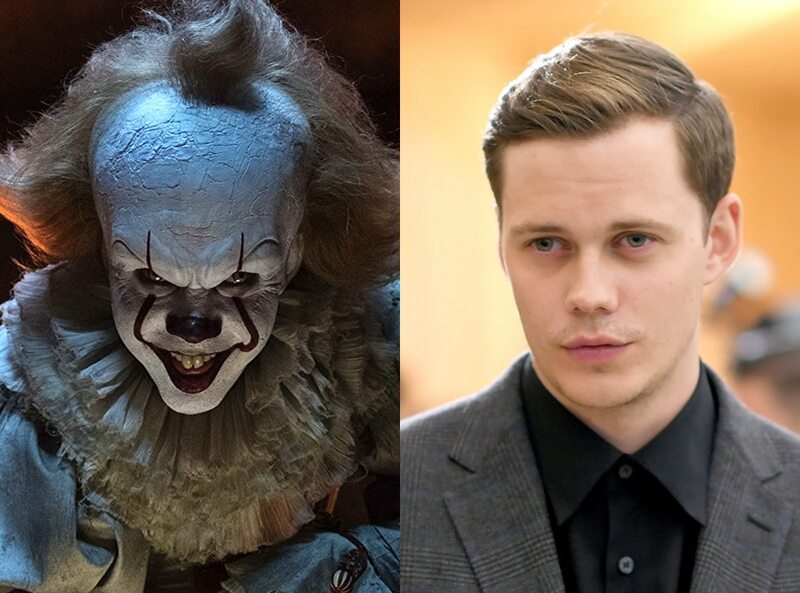 Fans will be delighted to know he’s signed on to reprise his Pennywise role in Part 2 of the IT franchise, but we’ll be expecting fangirl squeals instead of startled gasps the next time around. One role that catapulted Jennifer Lawrence was Mystique in the X-Men series. Taking over from Rebecca Romijin in the original trilogy, Jennifer has made the blue shapeshifter symbolic to her name since – sleek-backed raven hair, yellow eyes and all. The process isn’t a pretty one however: Jennifer revealed it used to take eight hours for the entire process – which has since been reduced to three – and now wears a body suit instead of being arduously painted. The Academy Award-winning actress also once expressed indifference to being asked back for the role, although we can’t imagine anyone else playing the iconic character. 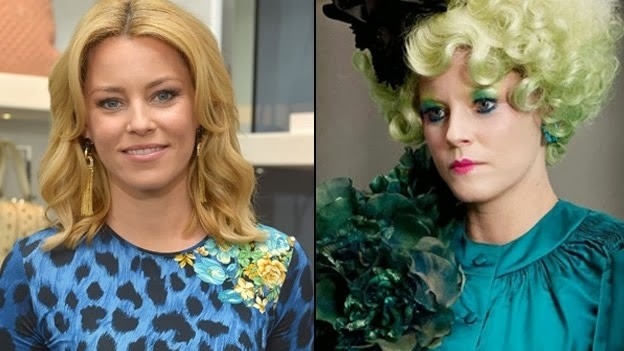 The Hunger Games‘ District 12 chaperone Effie Trinket might not look overwhelmingly foreign, but with her vast array of colourful wigs and outfits, it sure does make actress Elizabeth Banks unrecognisable to some. The veteran embraced the character’s outlandish looks over the span of four movies: “I would be in the hair and makeup trailer and I was Elizabeth, and then the wig went on and very suddenly I was Effie. Every day I would have that aha moment, like, ‘We did it! We found Effie!’ “, she told People magazine. Two years on since the last movie, the film franchise is still sorely missed, along with fan favourite Effie. The late Heath Ledger’s take on the classic Batman villain will go down as arguably the best one, but 30 Seconds To Mars frontman Jared Leto sure gave him a run for his money in Suicide Squad. Sporting coloured contact lenses, smudged makeup and body tattoos, Jared’s Joker was utterly terrifying (and the best part about the movie alongside Margot Robbie as Harley Quinn). In real life, a string of ladies from Katy Perry to Lindsay Lohan has dated the actor-singer, and we’re sure many would too even with him in full-on Joker mode. 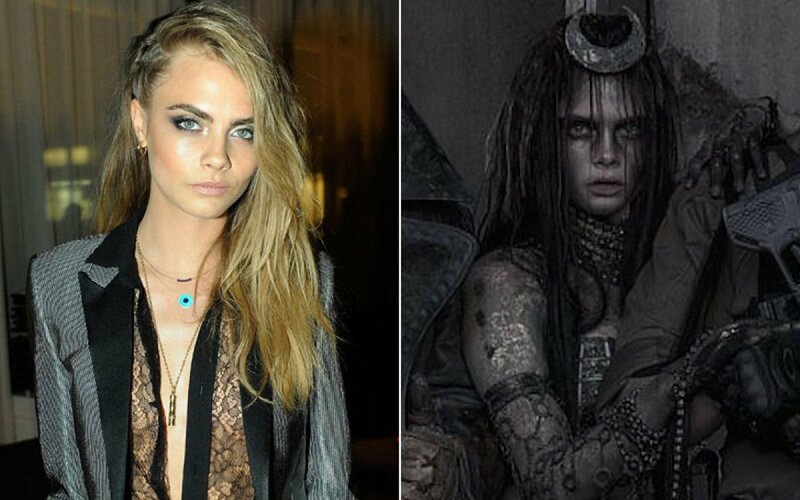 The Joker and Harley Quinn might’ve been the dynamic duo scene-stealers in Suicide Squad, but don’t forget the beautiful Cara Delevingne also had a spooky turn as the Enchantress. Ditching her long blonde locks and runway ready makeup, Cara looks polar opposite as the dark villainess, and it’s nice to see the affable star isn’t afraid to look ugly for a role either. She’s blue! No, wait she’s green! Whichever coloured skin Zoe Saldana sports, it’s undeniable that she pulls it off effortlessly. First seen as a computer-generated Na’vi in 2009’s Avatar, she caused heads to turn yet again as the sassy green-skinned warrior, Gamora in the Guardians of the Galaxy franchise – the latter of which took five hours of makeup everyday. Her dedication to her roles is certainly admirable, and there’s nobody else we can think of who would do both roles justice. 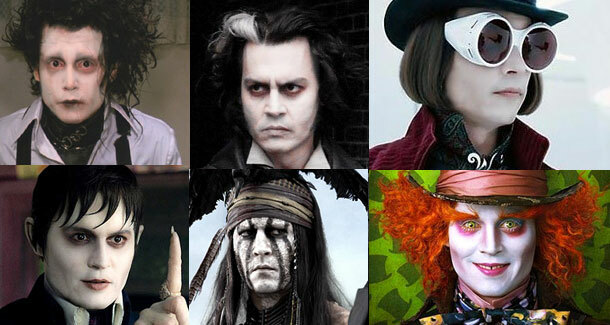 The ‘King of Transformation’ title undoubtedly belongs to who else, but movie chameleon Johnny Depp. From his unnerving role as Edward Scissorhands to demonic barber Sweeney Todd to the kooky Mad Hatter in the Alice in Wonderland series, we can’t help but to fall in love with the man behind the characters over and over again. In real life, the 54-year-old actor still drips in style, that we can’t help but to fawn over his every career choice. Bring on the next look, Johnny! Which of these drastic transformations were your favourite? Tell us in the comments below!